Posted in Bright Ideas / Research on February 1, 2019. The Local Search Industry Survey is an annual study that uncovers what it’s like to work in local SEO today. It explores how business practices, pricing, services, and salaries change each year. To note, the previous report was released in December 2017, while this report was released in January 2019 to provide a timely review of the industry for the whole year. We hope these results prove useful in benchmarking your agency or business against the wider industry. You can contact us on content@brightlocal.com if you have any questions on this year’s report, or share your thoughts on the report’s findings in the comments below. Which of these best describes your company? How many people in your company are SEO professionals? Is your business likely to hire more SEO-related employees in the next 12 months? 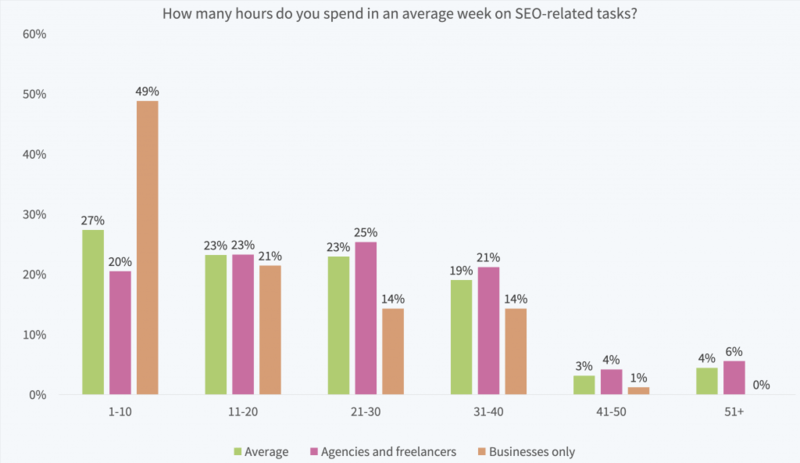 How many hours do you spend in an average week on SEO-related tasks? Which SEO / business tasks do you do? Which are your favorite SEO / business tasks? How optimistic do you feel about the SEO industry in 2019? Will you look for a new job in 2019? 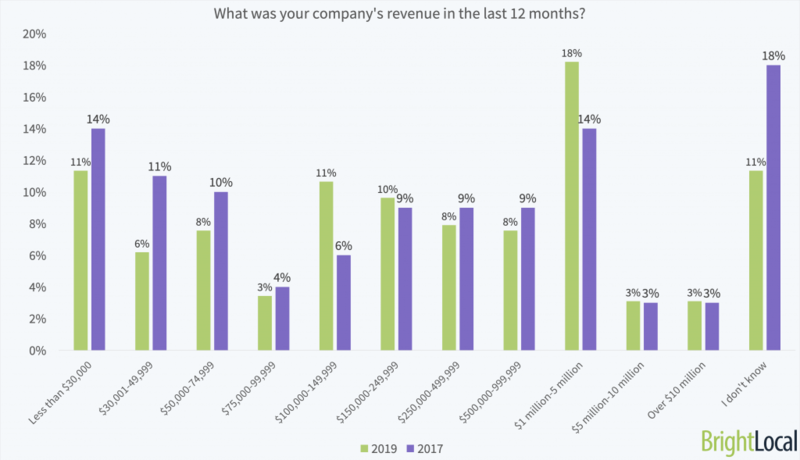 What was your company’s revenue in the last 12 months? 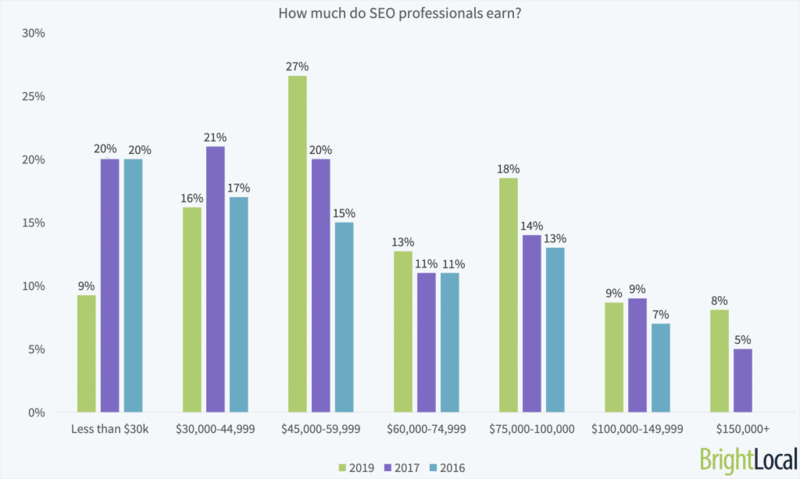 How much do SEO professionals earn? 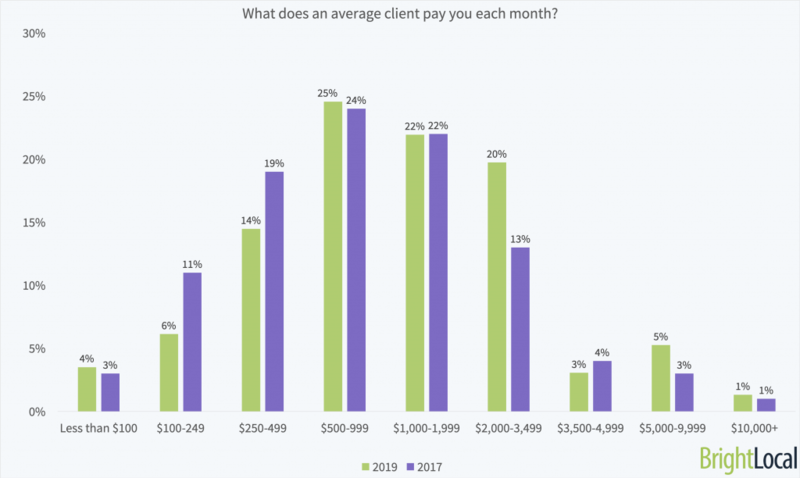 What does an average client pay you each month? What is your monthly retainer minimum rate? What is your hourly rate for SEO services? How many hours do you work in an average week? 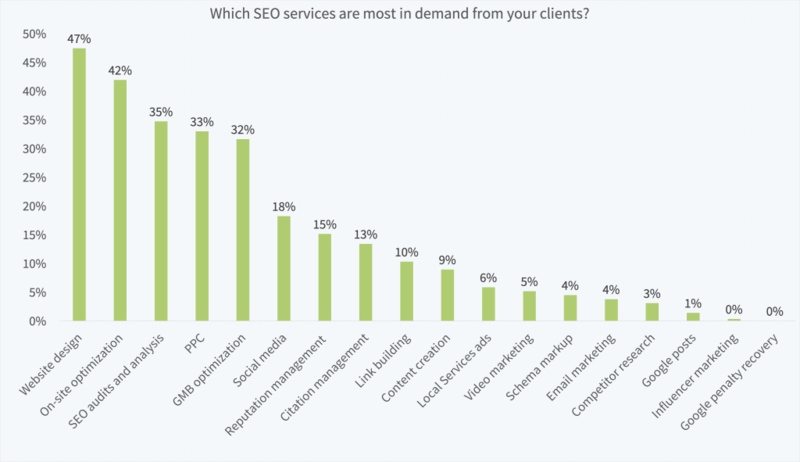 Which SEO services are most in demand from your clients? 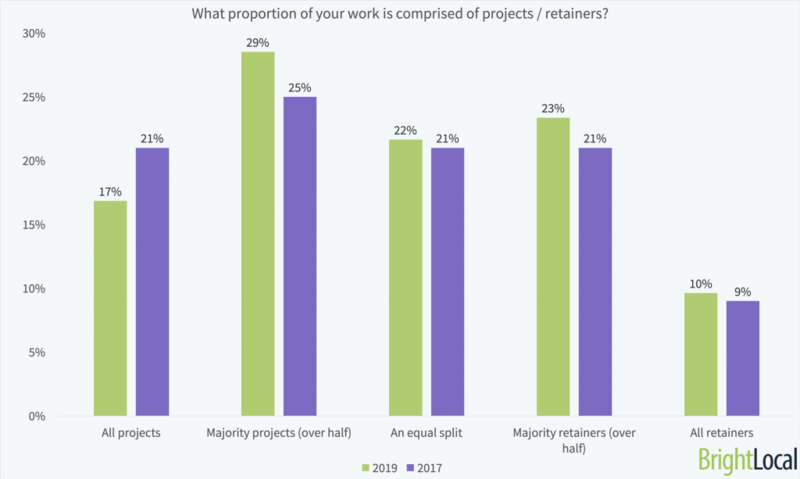 What proportion of your work is comprised of projects / retainers? How many different industries do you serve? 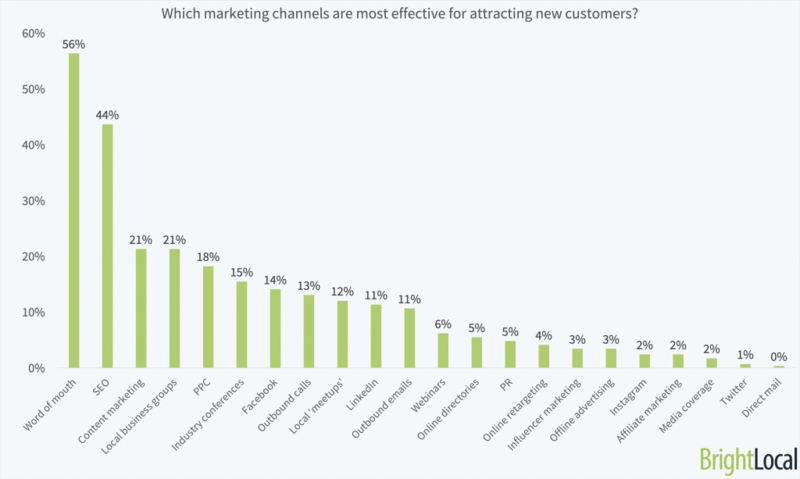 Which marketing channels are most effective for attracting new customers? How many new leads do you proactively contact each month? What is your estimated success rate at converting leads into clients? 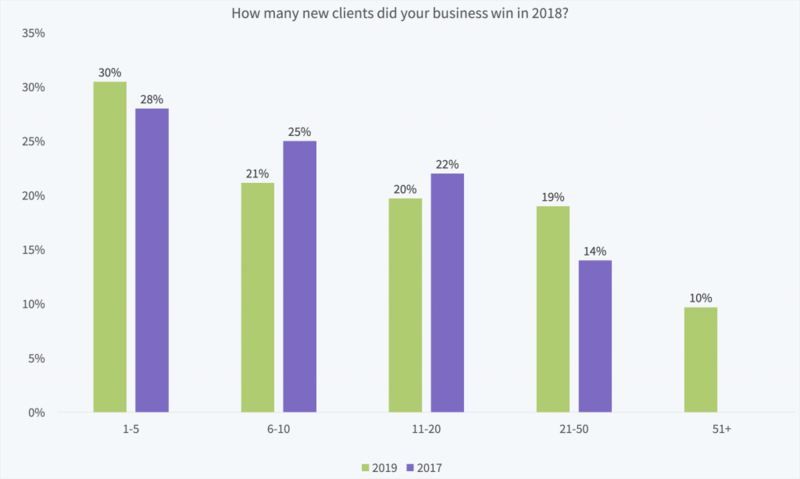 How many new clients did your business win in 2018? How much work do you outsource to third-parties or white-label SEO services? Will it be easier or harder to deliver results for clients this year? How much does your business spend on marketing each month? Who handles internet marketing for your business? How do you rate the performance of your external marketer? 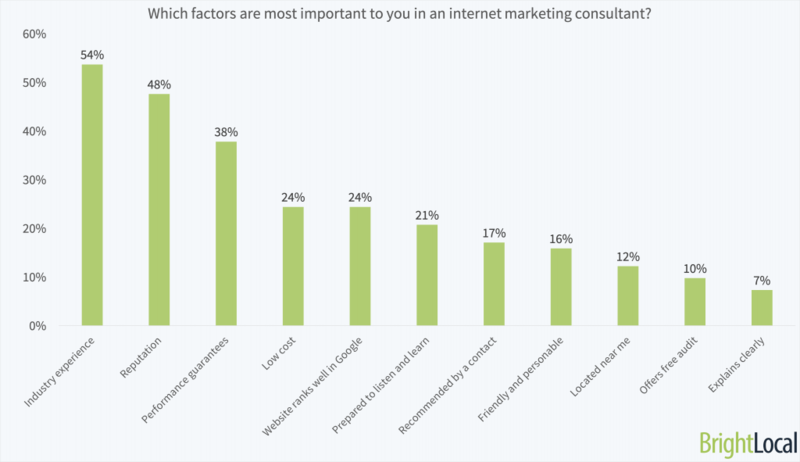 Which factors are most important to you in an internet marketing consultant? These questions were shown to all respondents, focusing on their business practices, workload, and aspirations. In this year’s report, there are more local agencies than last year. The proportion of national agencies also slightly grew, providing a larger overall sample of agencies. There was a small decline in the proportion of freelance SEOs sharing their experiences. Web design agencies also have a smaller presence this year. Respondents were also asked to share their job roles. 45% are in senior roles (founders and the C-suite), 34% are in mid-level roles (including directors and leads), and 15% are junior (such as account managers and project managers). We were pleased to have such a broad range of search marketers completing our survey to provide a representative view of local marketing today. Thank you to everyone who completed the survey. When looking at business size, the results are very similar to last year’s report. 57% of respondents work in businesses with 10 or fewer employees, while 19% work with more than 50. The median number of employees in respondents’ businesses is 6. The average is 323, with some businesses having a high number of team members. Interestingly, nearly half of respondents have just one SEO professional in their organization. Looking across the data, respondents work with an average of 6 SEOs – up from 5 last year. In both agencies and businesses, SEO professionals are clearly used to working in small teams. This is why it’s as important as ever for the local SEO community to share ideas and case studies, and act as an extended support network to learn together as an industry. While there are plenty of great local SEO communities out there for networking and learning, we at BrightLocal have a soft spot for the Local Search Forum. 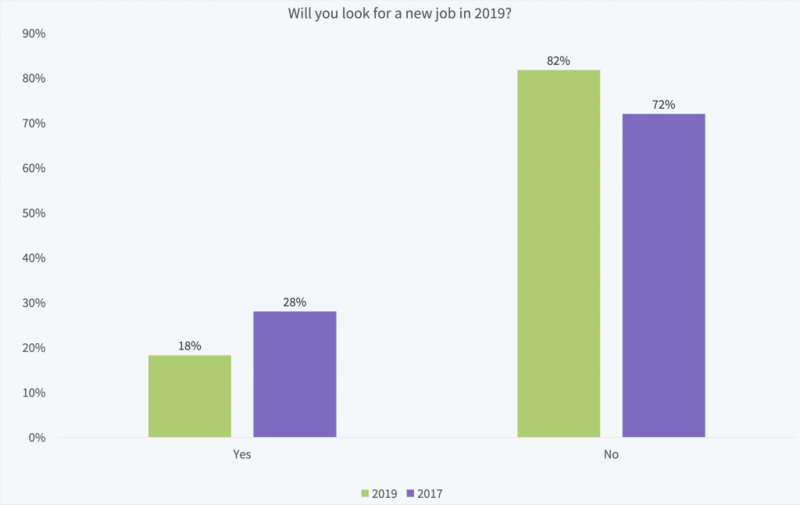 58% of businesses are planning to hire more search marketing professionals in the next 12 months, which is good news for any SEO professionals out there looking for a new job! Hiring expectations have slightly grown over the last year, after a steep drop from 2016-17. It’s great to see a significant proportion still looking to increase their search marketing capability with new roles after a few years of strong hiring. This could mean that the number of SEOs within companies grows over the next few years. Here, we’ve split answers for external and in-house marketers to demonstrate the difference in time spent on search-related tasks. As perhaps expected, businesses spend far fewer hours on SEO-related tasks than agencies. This could be due to in-house marketers holding a broader range of marketing responsibilities, while others (particularly those working for multi-location businesses) may be more likely to delegate to junior employees or outsource tasks to external marketers. Respondents were asked to share which local SEO and business-related tasks they perform. While the top ten consists of key search marketing skills, just outside are some newer skills. 83% of respondents create Google posts. This relatively new feature of Google My Business is still being tested, but if it holds a prominent place in the Knowledge Panel, could be an incredibly useful marketing tool for local businesses. Google’s Local Services ads are also commonly completed by search marketers – with 59% doing these regularly. Local Services ads are relatively new to the local marketing game, but receive 13.8% of front-page SERP clicks. We expect to see more marketers using LSAs by next year as these roll out to even more locations. The above data is based only on the respondents that do this task, from the previous question’s results. Respondents were asked to rate how they feel about tasks, from which we determined which tasks are most ‘liked’ and ‘loved’. Local search consists of a wide-reaching range of different tasks, and of course, it’s human to enjoy some tasks more than others. There are plenty of parallels between the most common tasks and those most enjoyed by search marketers, with some notable exceptions. Just 52% of SEOs like or love link building, yet nearly every SEO performs this task. Likewise, the commonly performed task of building and cleaning up citations is only enjoyed by 65% of marketers. Both of these are critical local search ranking factors, but can be quite time-intensive, and perhaps not the most exciting for seasoned marketers. Of course, if you’d rather we took citation management off your hands, we can do this for you. This year, 93% of search marketers are optimistic about what’s next for the SEO industry. We were pleased to see a growth in the proportion of people who are ‘very optimistic’ about the future. 2018 brought with it a range of interesting changes for local businesses to get to grips with, including the Maps ‘Follow’ button; the end of Google+; Facebook’s review ratings changing to ‘Recommendations’; the August algorithm update; the mobile-first index rolling out widely; the release of the GMB Agency Dashboard; and too many more to mention. If new tools, techniques, and trends roll out at the same rate as they did in 2018, local marketers are in for a challenging (but exciting) year! Fewer local marketers are planning to find a new role this year, following a height of 28% last year. This drop could be due to the high number of people that were looking for a new job last year, who are presumably now settled into a new role and not looking to move on. With so many businesses looking for new SEO specialists to join their teams this year, it looks like there will be lots of choice for those looking to move jobs. These questions were shown only to respondents from marketing agencies, web design agencies, and marketing freelancers. Questions address consultants’ search marketing experiences, including company revenue, salary, numbers of clients, costs of services, and lead generation. The average revenue for marketing agencies and freelancers is $1.2 million. This year, we saw a higher proportion of respondents working in businesses earning over $1 million, driving up the average revenue. When looking at the median, this year’s sample has a median range of $250,000-499,999, up from $150,000-249,999 last year. Of course, it’s difficult to conclude that businesses have seen huge revenue growth across the last year. However, with many marketing businesses looking to increase their SEO staff, as well as growing monthly charges and hourly rates, it’s highly likely that many agencies and freelancers grew revenue in 2018. Respondents were able to opt out of sharing salary details. 41% chose not to, and the following data is based on those who did share this information. SEO professionals earn, on average, $81,103 per year – up from $61,711 in 2017. Over the last few years of the Local Search Industry Survey, we’ve seen continued year-on-year growth in search marketers’ salaries. Now, just 9% earn less than $30,000 – down from 20% of respondents in 2016 and 2017. The biggest growth is in the $45,000-59,999 salary bracket. We also noticed a small growth in the proportion of respondents earning over $150,000 each year. The median salary for search marketers is $64,000 – higher than the average for households in the US. The importance of search marketing for local businesses is growing, and thankfully, salaries are growing too. Search marketing agencies are paid an average $1,779 per client each month, up from $1,670 in 2017. 49% receive an average fee of less than $1,000 – down from 57% last year. The biggest growth was in the $2,000-3,499 bracket. With local businesses requiring an ever-growing suite of marketing services, marketers able to offer a range of add-ons and upselling options will be able to capture a larger proportion of marketing spend. But, beware of stretching yourself too thinly. The median minimum monthly retainer range for local marketing services is $500-699. 67% of marketing businesses charge a minimum of less than $1,000, down from 75% last year. In 2017, minimum retainers were lower than in 2016. We hypothesized that this may have been due to marketers offering new services, but not offering them at a cost-effective or competitive price. Now that clients no longer have to be convinced to ‘try out’ these new services, could marketers be billing clients based on value? Recurring revenue can be hard to come by, but retainers are important in helping agencies and freelancers plan their time and resource. 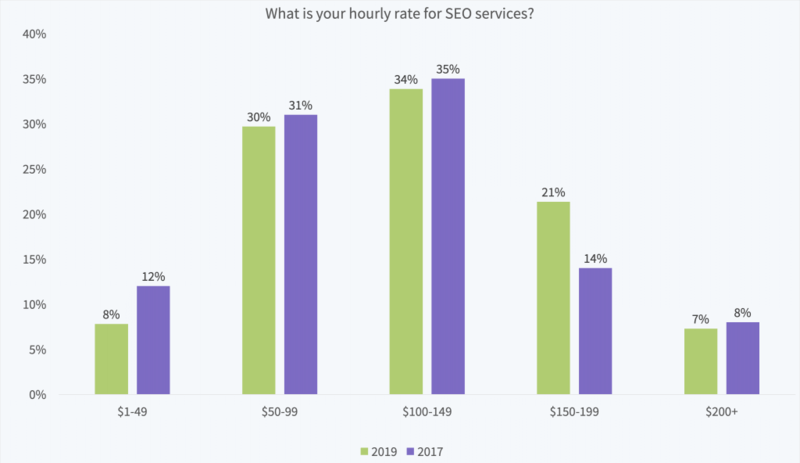 SEO marketers charge an average hourly rate of $119, up from $110 in 2017. Local marketing providers are now charging slightly more per hour than a year ago, with 63% billing more than $100 an hour. In 2017, this was 57%. $100-149 is the most popular hourly rate for SEOs, with 34% charging this amount. More marketers are now charging between $150 and $199. 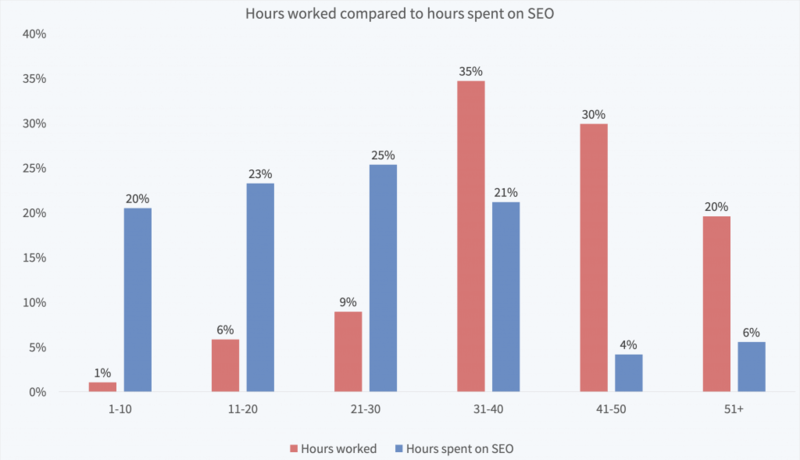 The above chart compares the time spent on SEO by respondents from marketing agencies and freelancers, with the number of hours these groups work. Search marketers work an average of 44 hours each week, with half working more than 41 hours (up from last year). This is higher than the average American worker, who works 34.5 hours per week. Agencies and marketing freelancers spend an average of 26 hours each week on SEO-related tasks – 10 more than those in local businesses and brands. This means the average internet marketing consultant spends 59% of their time on SEO-related tasks. Of course, not all time can be billable, but this equates to the average marketer spending two days a week on non-SEO related tasks. Does this ring true for your business? Let us know in the comments below! Respondents were limited to a maximum of three choices. The option ‘SEO audits and analysis’ was introduced to match with other questions in this study. For this year’s study, we added some new options, including schema markup, Google posts, Local Services ads, and influencer marketing. While of course, we can’t include every possible task, we wanted to see how aware local business clients are of such ‘new’ local marketing tactics. None of these services displace any of the traditional top ten, though there is clearly some demand. Reputation management has climbed the most in-demand services for clients. Perhaps this is no surprise, seeing that 50% of local marketers don’t have enough time to spend on online reputation management. Local search marketers have a slightly higher number of clients than last year. 46% work on more than 11 clients, up from 43% last year. 31% of SEO consultants have five or fewer clients – down again from 33% last year, and 40% the year before. Client numbers are slowly rising, perhaps in line with local businesses realizing the importance of online visibility. SEOs are a little more likely to work on projects than retainers. Of course, it can be hard to sell retainers to businesses with limited budgets. Instead, many local businesses choose to use marketers on an ad hoc basis, perhaps during an algorithm update, or if they see rankings drop. Now that the Google My Business app is targeted at business owners, as well as Google Ads adding campaign management functionality, it’s important for marketing consultants to demonstrate value to potential clients on an ongoing basis. Over the last few years, there has been a dip in the proportion of marketers who work across 4 or more industries. Instead, more marketers are specializing in a few niches. Finding your niche can be an excellent way to prove your worth to clients. Really knowing an industry’s challenges allows SEOs to focus on improving local businesses’ visibility, without having to spend time learning a new industry’s quirks. However, be careful of working with clients’ competitors, and having to compete against yourself! Respondents were limited to a maximum of three choices. Word of mouth remains the most important marketing channel for agencies and freelancers to attract new customers. Whether this is through recommendations from peers or online, the best advice we can give you is to be a business worth recommending. Of course, SEO remains critically important when attracting new local business customers. Whether it’s having a strong presence on Google or a great reputation – remember to practice what you preach! Interestingly, content marketing has climbed the ranks of marketing channels for generating local business leads. Content is a great way to differentiate from your competition, showing potential customers that you’re on top of the latest news and tactics, offering insights beyond your competitors. Social media has slightly dropped in importance this year, while face-to-face networking is more important. There has been growth this year in the proportion of search marketers being tasked with proactive outreach to new leads. Despite this, marketers are contacting fewer leads apiece. 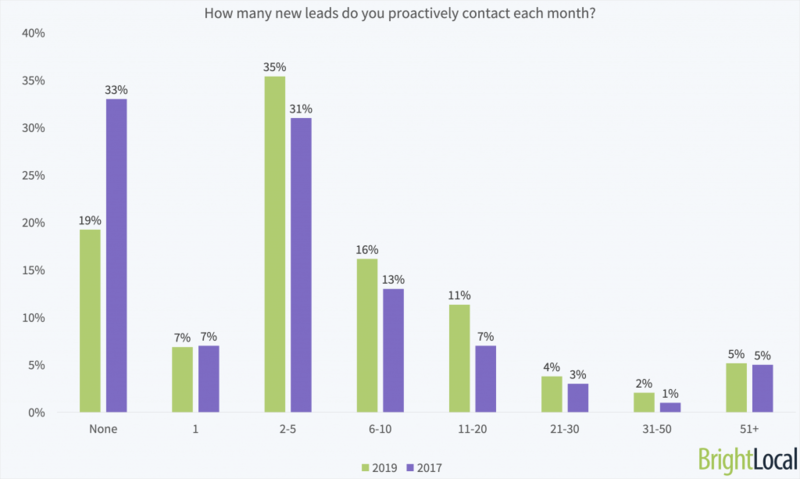 58% contacted 10 or fewer leads, compared with 51% in 2017. As shown above, the number of clients each marketer works on has grown, yet mass proactive outreach is dropping. Could this be down to inbound channels such as word of mouth and SEO doing a lot of the lead generation legwork for agencies? Marketers’ lead conversion rates grew over the last year, with the proportion converting less than 10% of leads dropping dramatically. While last year, 75% of marketers had a lead generation success rate of less than half, this year, this dropped to 66%. While more marketers are now undertaking small-scale lead outreach, the growing success rate suggests they’re now far more successful. This could be due to marketers focusing more on targeted and qualified leads, or because of the focus on alternative marketing channels. We added the new option ’51+’ here for larger agencies. As you’d expect from increased lead conversion rates, new client numbers grew this year. Last year, 14% won over 21 new clients. This year, 29% of respondents’ businesses did. 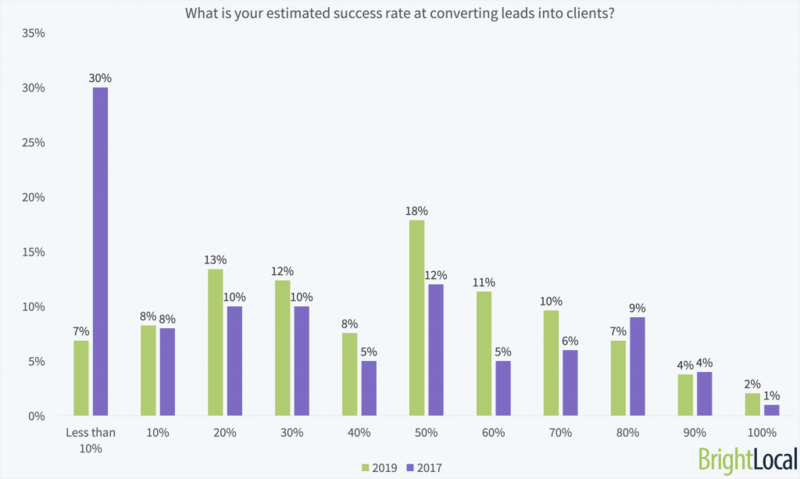 While marketers are contacting fewer leads each, the dual change of more marketers contacting leads, and the importance of inbound channels will likely explain the growth in new clients. Local businesses continue to wake up to the importance of local SEO and marketing services, and marketers must be ready to help them! How much work do you outsource to third-parties or white label SEO services? SEOs outsource and white label more SEO services than in 2017. 26% of marketers outsource or white label more than a quarter of their work, up from 17% last year. The proportion of marketers not outsourcing at all has seen a big drop. Outsourcing can have a bit of a negative reputation, but with the ever-increasing range of tasks marketers are expected to perform, it makes sense to spend time where you can add the greatest value. Redistributing your workload to focus on the tasks you most enjoy is a great way to continue to enjoy your job. As they say, work smarter, not harder. Do you think it will be easier or harder to deliver results for clients this year? Far more people are expecting this to be an easier year for delivering results. Yet, unfortunately, the majority still expect a hard year ahead. To help you feel better about 2019, take a look at leading local search experts discussing their expectations and predictions for this year. These questions were shown to respondents working in local businesses, franchises, and brands. It focuses on the experiences working with external marketers and agencies, as well as average marketing spend. The local businesses, franchises, and brands in our study are now more likely to spend more than $5,000 a month on marketing. At the other end of the scale, slightly more businesses are spending less than $100. The median range for businesses’ marketing spend is $1,000-4,999 for the second year running. To capture the highest proportion of businesses, agencies should develop offerings for this range, with higher and lower options available for those looking to scale up, or with tight budgets. 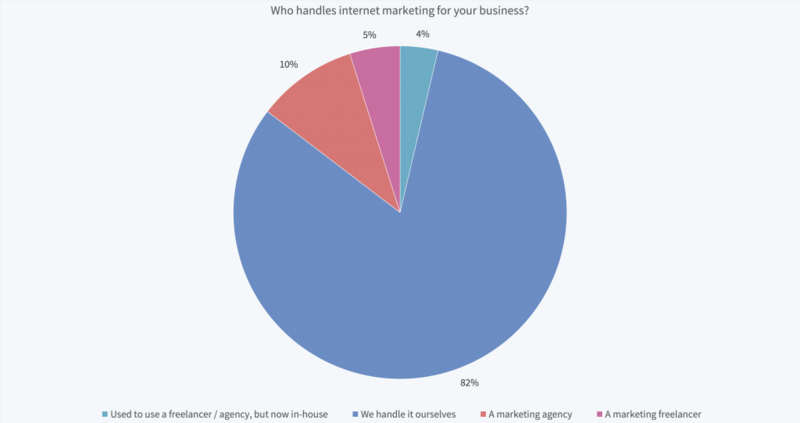 Most of the local business marketers in our study handle internet marketing in-house, with just 15% using a freelancer or agency. It’s important to note that this study was primarily answered by BrightLocal’s audience, targeted via email and social channels, with a smaller reach beyond this to local marketers. Therefore, respondents may be a little more likely than the norm to handle marketing themselves. The above chart is based on in-house respondents who do use an external marketer. While the above chart represents a small sample of respondents, it’s great to see so much positive feedback. On the whole, in-house marketers like their external consultants. Only 10% think their marketers aren’t up to scratch, down from 19% last year. External marketers are performing well, but, judging from findings above, there is still room for agencies and freelance SEOs to win (and wow!) business clients. It’s no surprise that businesses want the same qualities in marketers as reported by agencies and freelancers above. Industry experience is the most important factor to businesses, which may account for the dip in people working across a broad range of industries. Guarantees on performance is something that comes up highly time and time again. We asked marketers whether SEOs should guarantee their work, and the answer was ‘No’. Instead, marketers should educate customers on why success can’t be guaranteed, and instead offer practical targets to measure against. With word of mouth being the most important source of marketers’ leads, it’s no wonder reputation is so critical to marketers. However, our recent Google Reviews Study found that marketers are one of the least likely industries to have reviews on Google, with just 53% of marketing businesses having at least one. Of course, ranking in search results is important for businesses seeking an internet marketer. It’s unlikely a business would trust a marketer with their online visibility if they weren’t able to achieve the same results for themselves. Your own business website should act as a showroom for what you can achieve. And, of course, cost is a critical factor when choosing a marketer. Local businesses often don’t have a lot of budget spare for marketing, and agencies will need to prove their ROI if they are to convince clients of their need. Search marketing is valuable, so don’t sell yourself short. Thanks for reading this year’s Local Search Industry Survey! We hope this information helps you to benchmark your performance against your competitors, and to provide the best possible service to clients. To receive further insights on the local SEO industry, take a look at our blog.